The Swedish duo's new album emerged from the most difficult period of their personal and professional lives. Klara Söderberg explains. 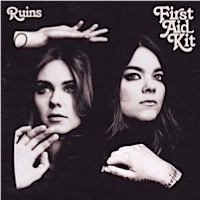 When Klara and Johanna Söderberg, the sweetly harmonizing Swedish siblings who record under the monicker First Aid Kit, dubbed their latest album Ruins, they weren’t kidding around. After the breakthrough success of their last release, 2014’s Stay Gold—led by flagship single “My Silver Lining,” which was used everywhere from a Renault commercial to entrance music for UFC fighter C.B. Dolloway—kid sister Klara saw her life collapse around her. Exhausted, she stopped touring in 2015, returned to her fiancé in her then-home of Manchester, England, promptly broke off the engagement, and wound up virtually alone with Johanna back in Stockholm. What she came up with became First Aid Kit’s fourth studio album, which is set for a Jan. 19 release. And it’s not exactly “fun.” Ruins, which was later fleshed out with Johanna and produced in Portland by Tucker Martine (My Morning Jacket, Laura Veirs), with backing contributions from R.E.M.’s Peter Buck, Wilco’s Glenn Kotche and Midlake’s McKenzie Smith, is a dark lyrical travelogue set to sunny, folk-jangled chords, from chugging opener “Rebel Heart” (“Now all I hear is the wind/ There’s a storm coming through”) to the loping, banjo-embellished “Postcard” (“I wasn’t looking for trouble but trouble came”), to the Dylanesque “To Live a Life” (“We were a lost cause long before we fell apart”) and the ominous epilogue “Nothing Has to Be True” (“Each and every breath we take/ A step toward death”). On the eve of the album’s release, Klara Söderberg spoke with Paste about making Ruins from ruins, her evolving relationship with her sister, and why the weather in L.A. can make a Swedish gal sad. These past 10 years have been a marathon for First Aid Kit. You actually hit a point of crisis on the Stay Gold tour. Well, I think it happened gradually, just being very tired. It was the kind of situation where maybe it’s a little thing that sets you off, not the biggest thing. I remember we were talking about making a music video, and we only had a few days off. And that meant that we were not going to have those days off anymore. And I just broke down completely, I just couldn’t do it. And then we just started saying no to things. And it was so sad, because it got to a point where we both couldn’t enjoy this thing that we loved. We went up onstage and wanted to give our all to all these people who had come to see us, and I just felt like I couldn’t. It was an actual physical thing. And that’s when you went back to Manchester, where your boyfriend was living? Yeah. Because always before, we’d get off tour, and we had four months to write the next record, then we’d go into the studio and then back out on tour again. So I just needed to…needed to live, because we’d been playing on the road for six years, ever since I was 16. So throughout all my teenage years and becoming an adult, all I knew about the world was being on the road. So I really wanted to know what else was out there. So it was August 2015 when we played our last show, and then we were off until April the next year. So then we met up, Johanna and I. Me and my ex-boyfriend had just split up before that, so I came to Los Angeles to meet up with Johanna there, and we went there to write the record. But I was in such an emotional state, which definitely had an impact on the record, on what it’s about. Well, we have mixed feelings about L.A. Some of our best friends live there, and we’ve had some absolutely wonderful times there. But for us, just the weather itself was hard. Just coming to a place and feeling so sad and alone, but the sun’s just always in your face. It’s like, “Yes, okay, I get it, I’m supposed to be happy. But I’m just not.” That was the feeling. Was it the demands of being in First Aid Kit that killed your relationship? No. It was just time. And we’re still friends an there’s no bad blood between us. That was just the time for that relationship to end. It was a very beautiful thing and of course it was very sad. And for me, it very shocking because I was very young and I had this idea of where my life was going, and then all of that changed, and I had to reconsider everything. That’s a lot of what this record is about. What did you learn about yourself through Ruins? I know your relationship with Johanna has been rocky at times in recent years. That that’s the whole point: You’re always learning about yourself, getting to know yourself better. And I’ve been going to therapy, too, which is really great. But it’s good to know yourself, to know where your limits are. And with me and Johanna, that’s something that we have to work on, on our relationship and knowing when to speak up and say no, or just say what I think. Because Johanna is so driven, and it’s a wonderful thing. But sometimes it’s just too much for me, and you have to say no. So that’s something we’re working on, and we’re getting better at it all the time. Watch this exclusive video of First Aid Kit performing “Emmylou” at the 2012 Newport Folk Festival.